Kettlebell is an important gym equipment used to increase your stamina and strength. It is made of cast iron and used to perform ballistic exercise, which is a combination of cardiovascular, strength and strength training. Exercise with kelltebell build strength and endurance, particularly in the lower back, legs, and shoulders. Kettleebell is also known as Griya, and used in the sport called Girevoy. It exercise equipment was developed in Russia and is traditionally measured in weight by pood. 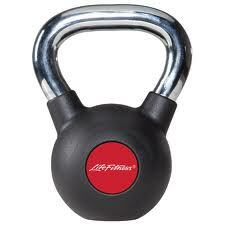 Kettlebells are quiet similar to dumbbells and generally involve exercise of the arms and upper body. Zhejiang Kanglaibao Sporting Goods Co. Ltd.
Kettlebell Push-Up – this one aims your Chest, arms, back.You can use kettlebell handles for push ups instead of using floor for it. It will be little harder but will give great results. Power Plank of Kettlebells– this one targets your Abs, arms, back. Hold kettlebells in both your hands while standing in plank position . Now lift it up so that it reaches near your hip while keeping you lower back down. Do this 9-10 on each side. Deadlifts by Kettlebells– this one aims at your Legs, glutes, arms, back. People usually uses barbells for deadlift but one can perform it using kettlebells also. Whil holding the kettle bells squat down and grab a hold of the handle with both hands while the back remains flat. Engage the core, tighten those glutes, and keep the arms extended as the body rises on up, kettlebell and all. Kettlebell Bent Row– Squat slightly while holding the kettlebell in you right hand and keep your torso parallel to the floor and hang it at arm’s length . Keep your torso still as you pull the kettlebell to the side of your chest, elbow close to your side . Lower back to start. That’s one rep. Do 10 to 12, then repeat on the other side. Read More About KettleBells Workouts and Exercises ..